At first glance, you may not notice that an essential piece of mod kitchen equipment is missing. Do you see it? That’s right: there’s no refrigerator in sight! It’s actually installed inside the kitchen island. This inspired space-saving technique not only keeps the kitchen de-cluttered but ensures no one in the house has to rummage to find food! 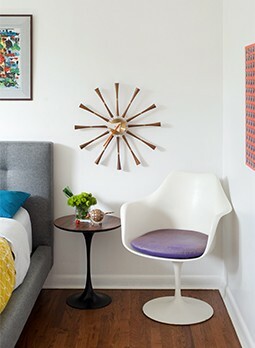 Chris’s last piece of advice for homeowners and decorators looking to achieve the midcentury modern look in their space is to cross the T’s and dot the I’s where it counts. Craftsmanship counts, and being meticulous about it will only enhance the look and not detract from it. This doesn’t necessarily mean that the more expensive the furnishing or décor piece the better. If it’s well-built and the reviews for it say that the piece stands the test of time (both style-wise and make-wise), you should go all in! Chris Pardo Design: Elemental Architecture’s philosophy is to realize inventive solutions that turn the constraints of each project into the design direction, exploring the relationships between space, program, form, budget and material. Their work ranges in scale from residential, commercial, hospitality, and civic buildings to large urban planning projects. Visit their website for more amazing projects!